St. Matthew’s and the Low Moss Stations – the Full Set! in collaboration with HMP LowMoss. 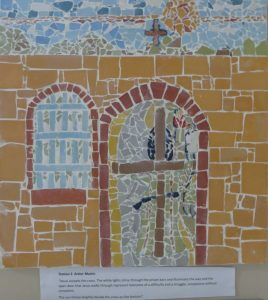 After much discussion with the Prison authorities and in particular with the Prison Chaplains and the Education Department’s Art tutors and students, several inmates began work on a series of mosaics which conveyed something of the reflections the lads had on the traditional Stations of the Cross. 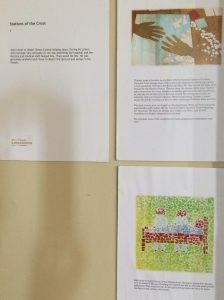 Originally, we received seven of these remarkable pieces of work, along with some narratives and descriptions of their work submitted by the prisoners themselves. Their stories are remarkable and very moving. More recently another six pieces of work were delivered, again with remarkable insights and moving stories. 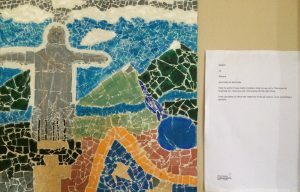 The mosaics are on display in St. Matthew’s Church, along with their respective stories and commentaries, and they are depicted here, alongside the written pieces. 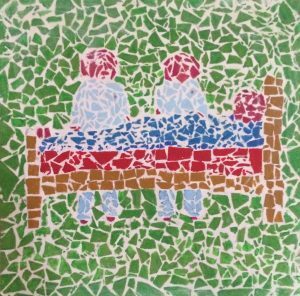 Our sincere and grateful thanks to all staff and chaplaincy members of LowMoss who embraced this project to enthusiastically, and inspired the artists to produce such moving and stimulating art and stories. 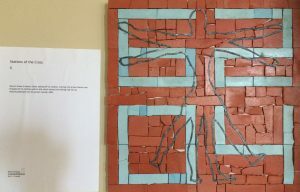 14 traditional Stations of the Cross….Not all of them were depicted. 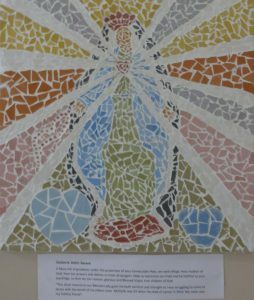 Here is the full set of images produced for St. Matthew’s by the artists of Low Moss. 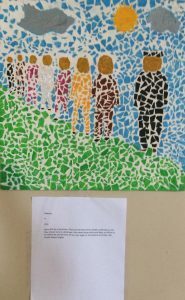 Our sincere thanks also to all staff and chaplaincy team members who embraced this project so enthusiastically, and inspired the artists to produce great things! “The first station where Jesus is sentenced to death. He knew he needed to die for our sins, although it was the wrong choice”. 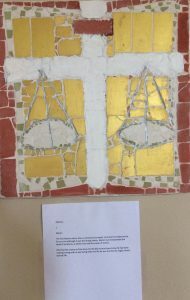 Martin has incorporated book of scriptures, a white cross and the scales of justice. “Pilate had the chance to free Jesus, but he did not, and Jesus knew that he had done nothing wrong and he was laying down his life for our sins that we might inherit eternal life”. “Jesus accepts the cross. The white lights shine through the prison bars and illuminate the way and the open door that Jesus walks through represent tolerance of a difficulty and a struggle, acceptance without complaint. The sun shines brightly beside the cross on the horizon”. NOTE: Lee was due to be released before he would have had time to make a mosaic of this station. 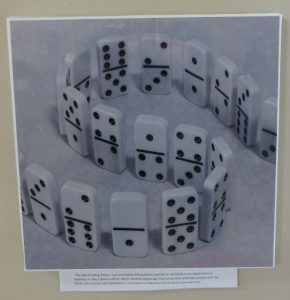 He wanted to be part of the project, so he opted for the photograph of the dominoes instead! 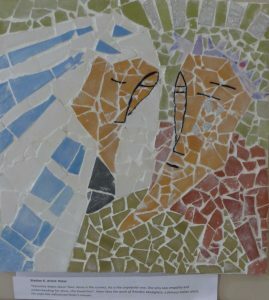 “Jesus meets his mother” This is Nelson’s mosaic. He took the composition from a wood cut by Kathe Kollwitz, an image of a mother and child. 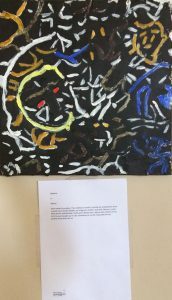 Nelson is colour blind and he embellished it with paint. Nelson has a tattoo with ‘mother’ on his arm. He was brought up in care. Sometimes it can be impossible for our parents to be there for us. 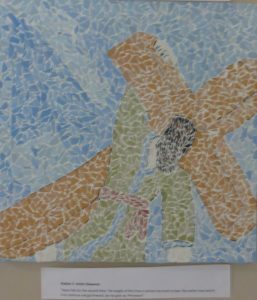 Station 5: Simon of Cyrene helps Jesus carry his cross. Artist: John. Peter likes the work of Amedeo Modigliani, a famous Italian artist. 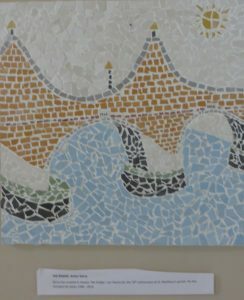 His style has influenced Peter’s mosaic. Station 8. Jesus meets his mother. Artist: Gerard. O Mary full of goodness, under the protection of your Immaculate Heart we seek refuge. Holy mother of God, hear our prayers and deliver us from all dangers. Help us overcome our trials and be faithful to your teachings, so that we can remain , glorious and Blessed Virgin, true children of God. “This short novena to our Blessed Lady gave me both comfort and strength as I was struggling to come to terms with the death of my eldest sister. Michelle was 42 when she died of cancer in 2010. My sister was my faithful friend”. Station 9. Jesus falls the third time. Artist: John. “Help me admit I have made mistakes. Help me say sorry. Thank you for forgiving me. I love you and will always do the right thing”. 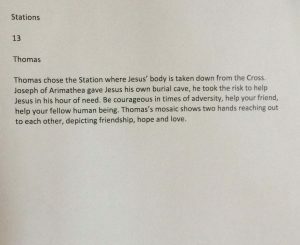 Thomas chose the station where Jesus’ body is taken down from the cross. Joseph of Arimathea gave Jesus his own burial cave. He took the risk to help Jesus in his hour of need. 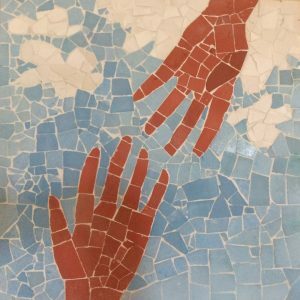 Thomas’ mosaic shows two hands reaching out to each other, depicting friendship, hope and love.